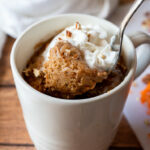 This Super Easy Carrot Cake Mug Cake recipe is perfect for satisfying that sweet tooth craving in minutes! Mix all dry ingredients together in a 12 oz microwave safe mug. Stir in the shredded carrots, vanilla and milk. Mix well, especially the bottom so there is no dry bits stuck at the bottom. Cooking times may vary based on the wattage of your microwave. This recipe was tested in a 700 watt microwave with a 2 minute cook time. If your microwave is higher wattage, watch for doneness around 1 minute 15 seconds to 1 minute 30 seconds (or more). The cake should rise in mug and not be wet looking when done.